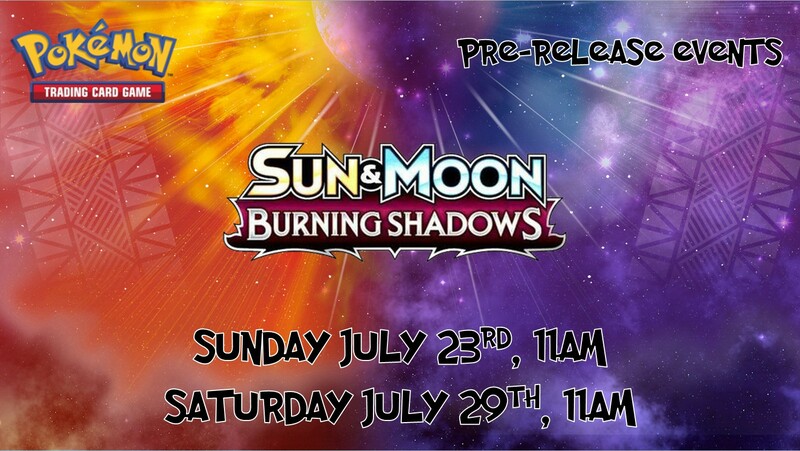 Join us for the exciting pre-release of Burning Shadows, the 3rd set of Pokemon Sun and Moon! Each player will receive a Burning Shadows pre-release kit containing 4 booster packs of Pokemon Burning Shadows, a Promo card, and a special Evolution pack. At the completion of the event, each player will receive an additional 3 Burning Shadows booster packs. Each event begins at 11:00AM on it’s respective day. Pre-registration is strongly recommended as Pokemon pre-releases have been known to sell out. Each event will be capped at 52 total players. Entry is $25 for each event. Players can play in either or both events. Please see our Event Registration Page to sign-up online and reserve your spot.